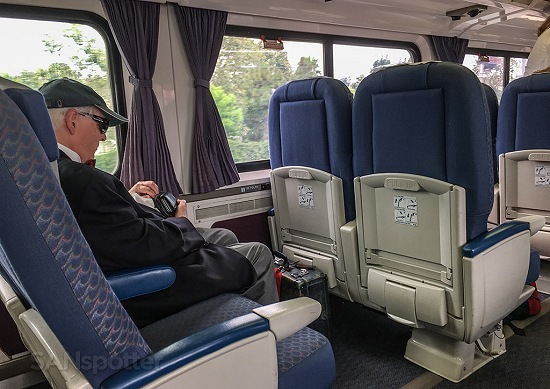 For millions of travelers who live along the Interstate 95 corridor – Amtrak is the quickest, easiest, least stressful, most productive and often cheapest mode to get from Connecticut to downtown Washington. The same is true in many other communities nationwide. But is “airline creep” working its way into Amtrak’s policies, pricing, fees and service? It’s a reasonable question, since the former CEO of Northwest Airlines and Delta Air Lines is now the CEO of the nation’s train line. He was appointed by Amtrak’s board in July 2017. Three months later former Continental and Northwest executive Tim Griffin was named Amtrak’s chief marketing officer; then an ex-Northwest and Delta officer was tapped as Amtrak’s chief safety officer. Other former Delta execs now head up the “passenger experience” and “product development & customer experience” departments. The rail line also introduced a more complex pricing option in May, by launching 25 percent off on reservations booked 21 days before travel. The three-week advance fare is one of the most common and complex pricing “buckets” employed by airlines. • Ticketing. Lisa Beth, who travels frequently from New York City to visit family in Baltimore, has indeed seen changes in the last year, and some are positive changes: “I noticed a few months ago they reupholstered the seats and made them much more comfortable, what you would want on an airplane.” But she worries that stricter policies and fees are creeping in, and says, “I remember in the 1980s and 1990s, if I missed a train I would just take the next one. I had complete flexibility. Now it’s gotten more stringent. I noticed recently that if I canceled I could get an eVoucher, but if I wanted my money back I had to pay a fee. I worry that the rules will become even more restrictive.” Leocha agrees, stating Amtrak’s cancellation policy is now more “airline-like,” with penalties for most reservations canceled 24 hours after booking. Amtrak’s coach seats currently offer width of 23 inches and legroom “pitch” of 39 inches between seats, and much more in premium classes. Consider that the economy/coach sections of the Big Three Airlines – American, Delta and United – on workhorse Boeing 737s in domestic service offer pitch of 30 to 31 inches and width of 16.6 to 17.8 inches. Amtrak continues to offer much roomier seats, but the stats aren’t on Amtrak.com anymore, and don’t bother asking Julie, “Your Virtual Assistant,” because she’s not saying. • Seating policies. Several riders have noted Amtrak offers another big advantage over the airlines: more liberal seating rules. As one mother of two young children notes, “I wouldn’t want assigned seats when I’ve got my kids with me.” In fact, some customers suggest that just as Amtrak has Quiet Cars popular with business travelers, there should be dedicated zones at no cost for travelers with special needs, seniors and families with young kids. There’s no question this would be a huge improvement over airline travel, since the DOT has failed to implement a 2016 congressional mandate for domestic air carriers to allow families with children under 12 to sit together at no additional cost. Beth also loves the ability to get up and move around on a train – even the ability to move seats entirely: “Last week there was a woman on Bluetooth conducting a conference call right next to me. So I finally got up and moved. You can’t do that on an airplane.” Obviously switching seats won’t be an option if passengers are given designated seats. For those who question if this scenario is likely, it’s worth noting that in May Amtrak announced an assigned seating option for First passengers on Acela trains.